Cerebro App is a free, open source and cross-platform search application. It is a system-wide desktop search feature similar to Mac OS X and iOS spotlight application. It allows you to search and launch everything on your desktop system, including files, folders, images, media, documents, and system settings. To put this simply, It helps you find anything you’re looking for in your Linux desktop. It will work on GNU/Linux, Microsoft Windows, and Mac OS X. What can Cerebro App do? Anything! You can search anything either on your Computer or in Internet. Interact with everything in your systems. Say for example, you can browse file system, search and launch a program/application, copy contact details to clipboard, see google suggestions for any search terms, access Google maps and google translate online services, search on Stack overflow forums, and much more. Cerebro allows us to do everything from one place. By adding plugins, you can improve the functionality of Cerebro. Here is the list of supported plugins for Cerebro App. The following plugins works on all platforms. Stackoverflow – Search for answers to questions on stackoverflow website. Of course, there are some plugins only for Mac OS X. You can find all plugins on the product GitHub repository and official website (links are given at the end of this guide). Download the latest version from this link. As of writing this guide, the latest version was cerebro-0.2.6. Cerebro is available as .deb format and .appimage format for Linux systems. The .deb installation file can be installed on any Debian based systems whereas .appmage file can be installed on all Linux distros. If you downloaded the .deb file, you can install it on any DEB based systems such as Ubuntu, Linux Mint as shown below. Then, open it either from Unity dash or Menu. For other Linux distros, download cerebro.appimage file, and make it executable as shown below. And run it (for the time only) as shown below. Once you have installed and run it, it will sit on the system’s app indicator panel. You can launch it either from the indicator panel (taskbar) or press CTRL+Space bar to open it. Cerebro app will look like below. You can search through your file system. Just type a file or folder name, cerebro will look them for you. Type a few words, and press tab to auto complete and use up and down arrows to choose from the list of available items. Do you want to search anything on web? Just enter the search term, it will show you the relevant google search results. It can help you to launch an installed application from your Computer. To open an application, just type its name in the cerebro search box, and click the application to launch. The following screenshot shows you how to launch Terminal application. Can I translate a word to some other language? Of course, Yes! Just type the term in the Cerebro search box, and select ‘Translate’ and it will automatically translate that word to the destination language. The following screenshot shows the Russian language translation of ‘welcome’ word. Like wise, you can choose the destination language of your choice from the list. Do you want to run a command from cerebro app? No problem. Cerebro plugins got your back! Cerebro has few applications to do this. Type plugins in the search box and hit tab key. You will see the list of available plugins. 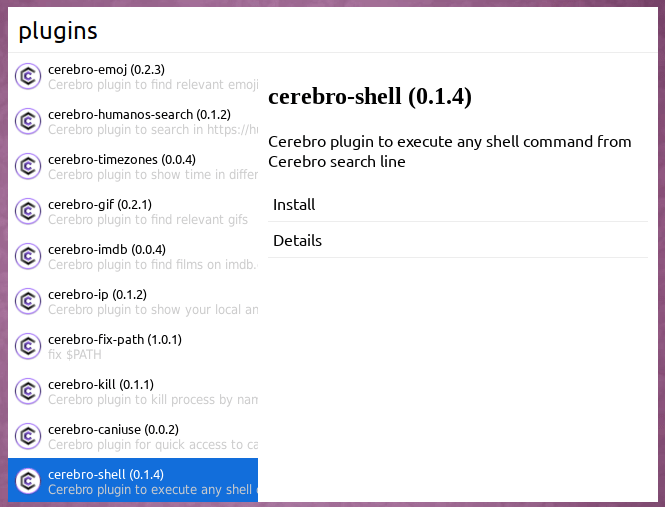 Choose ‘cerebro-shell’ plugin and hit the install button. Now, type your command that you’d like to run in the cerebro search box and hit ENTER key. The command will execute from the cerebro interface itself. You don’t need to open Terminal to run a command. Everything will be done from Cerebro interface. I want to see the IP address of my system, is it possible? Yes, it is! Install ‘cerebro-ip’ plugin as shown above. And then, type ‘ip’ in the search box. You will then see the IP address (local and external) of your system. I need some help for programming stuffs. No problem! Install ‘cerebro-stackoverflow’ plugin. Type the questions in the search box and get your answers right from the cerebro interface without opening Stackoverflow website. It is a cool feature for programmers. There are many other useful plugins available. These plugins can help you to search movie reviews from IMDB website, kill a running process, search for GIFs, search Emojis and so many, all from the Cerebro interface itself. Type plugins and hit the tab key, go through the list of available plugins list and install a plugin that you’d like to use. Cerebro app has small set of settings. To view the settings, type ‘settings’ and choose ‘Cerebro settings’ from the list. It has only few settings. You are allowed to change the hot key combination to launch Cerebro. The default key is CTRL+Space. And also, you can change the country and theme (light or dark). As far as I tested it, Cerebro does exactly what it says on the official website. I think it is a must have application in your arsenal. Give it a try. You won’t be disappointed.